[Dan] wrote in to share a project he recently finished up, an autonomous Airsoft tank. The toy tank makes use of a wide array of technologies to get the job done, and will stop at nothing to hunt you down (provided you are wearing an IR beacon). An Arduino board is used to control the tank’s motors, while a Lego NXT module handles most of the other operations. The tank makes its way around using an ultrasonic sensor, which ensures it doesn’t get stuck on any errant furniture or hung up in a corner. While driving around autonomously is well and good, [Dan] upped the ante a bit by making the Airsoft turret completely autonomous as well. 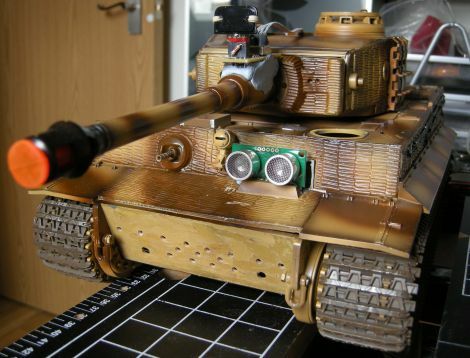 He fitted a Wiimote IR sensor to the tank, successfully interfacing it with the NXT module after a bit of trial and error. Now that things are up and running, he can place his IR beacon anywhere in the room, and the tank will drive around scanning its surroundings until the target is found. Once the tank locks on, a flurry of Airsoft pellets take down whatever stands in its way. We think that [Dan] did a fantastic job here, but see for yourself in the videos embedded after the break. Cool little project that. Laser dot tracking would be an awesome upgrade. hey that’s a great (and a bit scary) project. it looks like it works perfectly, good job. This is cool. If it were let outside… EVERYTHING WOULD BE WELTED! How about a pin hole camera to have action video of you taking out your enemy?? You should make a autonomous helicopter with a airsoft gun and make them fight each other. That would be awesome to watch. say you released this thing in your living room…. would it shoot at anyone using a ir tv remote? that would be entertaining to watch terrify some unsuspecting victims. How about illuminating the target with an IR pointer instead of using a beacon. BTW, I almost forgot…. I love it! Great job! Give me batteries. You have fifteen seconds to comply.